Modern Masters gave me some free paint to try out for this project! All opinions are my own! And now, it’s a fearless red!!! When you buy a house, you tend to rank the order of importance of your DIY projects. Usually, you start on the inside, starting with the ugliest eyesore, right? But the eye-sore called my front door, I lived with that for 4 years! Part of the reason is because the color of my brick is a bit “blah.” It’s this orange brick color that is limited in colors that can match it well. So I stuck with the brown. If it ain’t broke, don’t fix it, right? I mean, turquoise is my favorite color, but could you see this house with a turquoise door?? 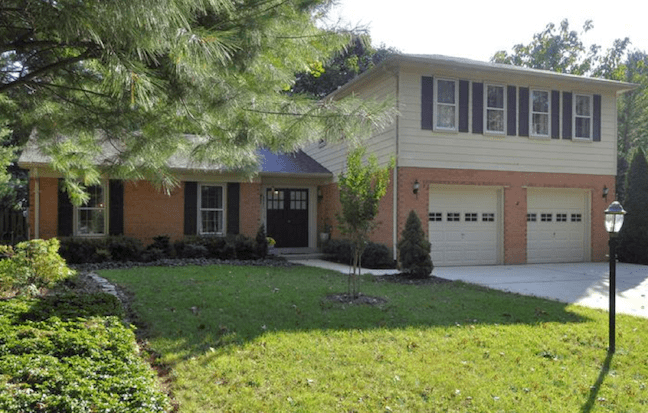 Dark brown door and shutters need an updated look in my 1970’s home! Another reason is because I could barely take care of the projects inside much less focus on the outside. (I still struggle with this). 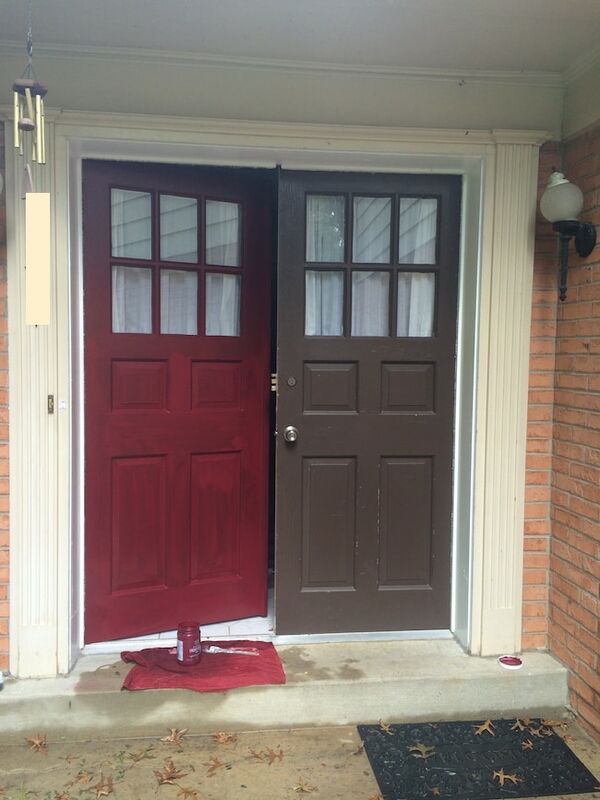 Painting the front door, it turns out, was such an easy update, even the most uncrafty person could do it! Here are a few tips to help you out. 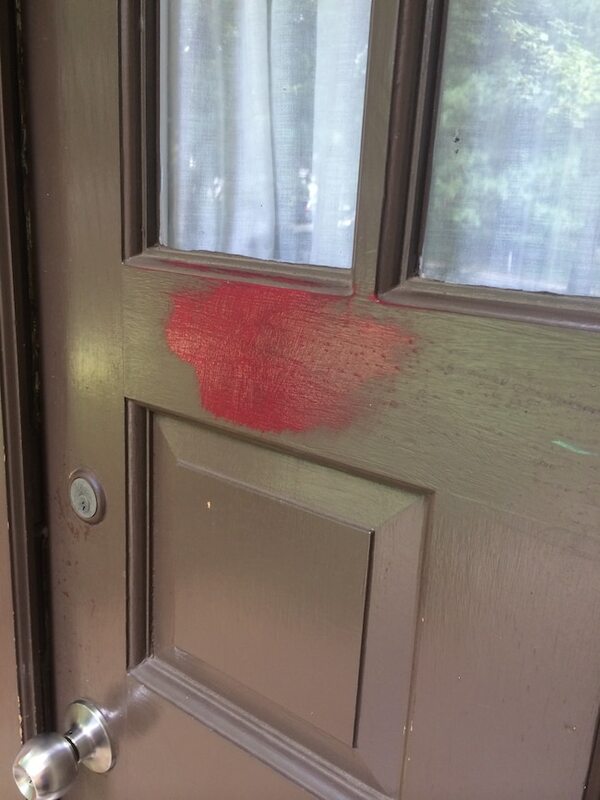 Probably one of the reasons I never painted my front door is because I didn’t know what paint to use. 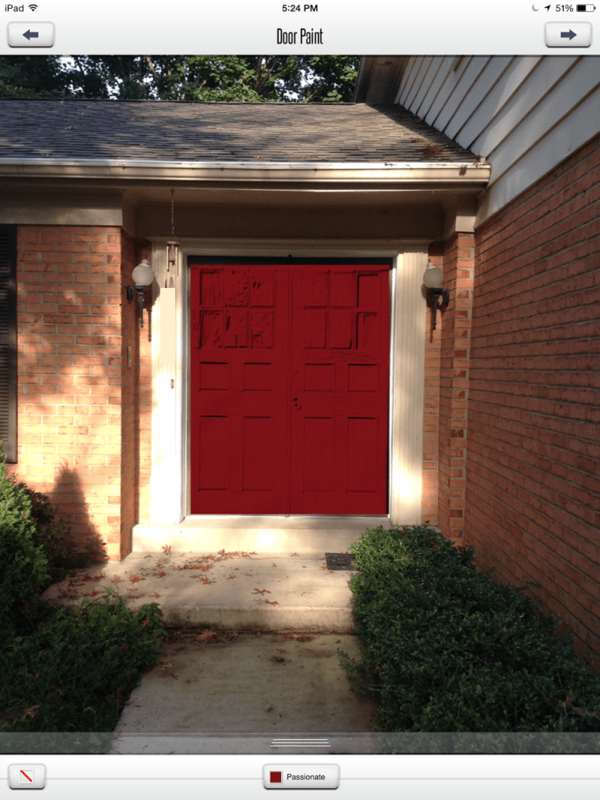 Recently, however, I had been offered an opportunity to try Modern Masters’ Front Door Paint. As a blogger, I love to try new products for my home (gotta love the perks!) :). So I figured I would give it a whirl. I mean, they claim it never fades. Probably won’t peel either. AND, I don’t think you need a primer. Now that I know it’s as easy as that, let’s get to it! And although I was a little nervous about the color I chose, I knew I could just paint over it again if I didn’t like it. After all, it is just paint. I just finished my kids’ bathroom makeover last week, and there’s this phenomenon in DIY: when you’re not working on a project, you go through DIY withdraw. It’s a real thing! Just check the DSM V…. 😉 LOL. So working on giving my door a punch of color was just what I needed this weekend. TIP #2 DIY All the Other Stuff, Too! 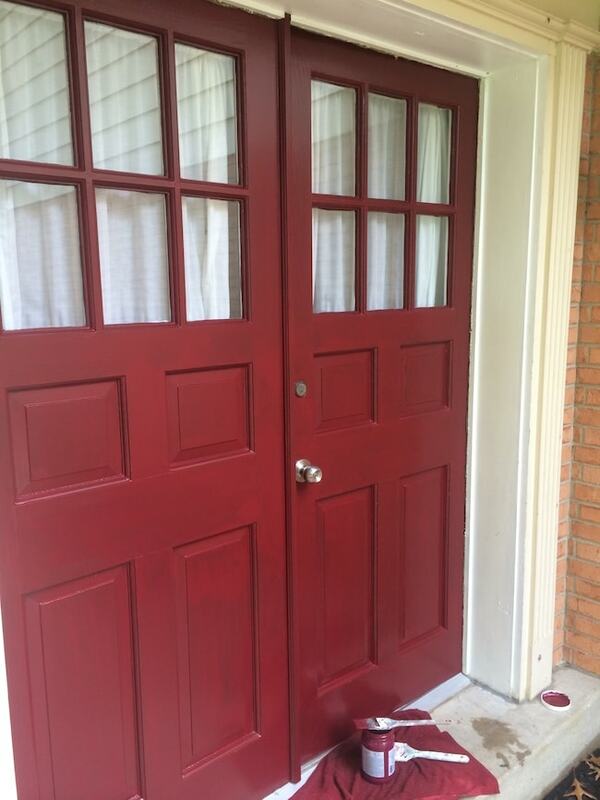 I can’t just paint my front door and call it a day. I’ve got to make sure the gutters are functioning (they were clogged). I’ve got to fix the lamps (I painted them, although I didn’t post pics of it). I wanted to make sure the whole surrounding area was taken care of, too. 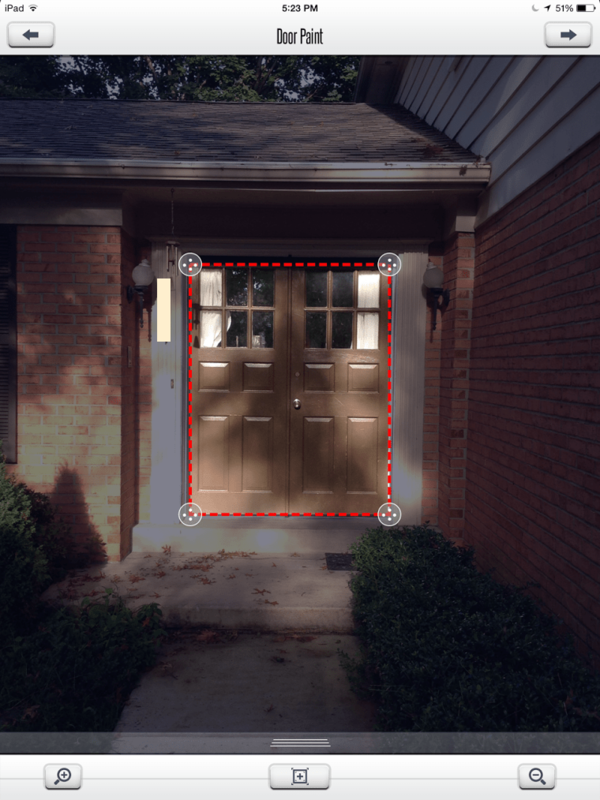 A front door is only going to look as good as its surrounding area! Let’s first back up to how my Sunday started this past weekend…. I just have to throw this in there because I was sooo proud of myself: I cleaned my own gutters!! When it rains, the water was just pouring down into the step below. I didn’t want any water to ruin my new paint job. Okay–I just the front section of this itty bitty lower level. But I’d never done it before. It feels good to take your home maintenance into your own hands, doesn’t it?? 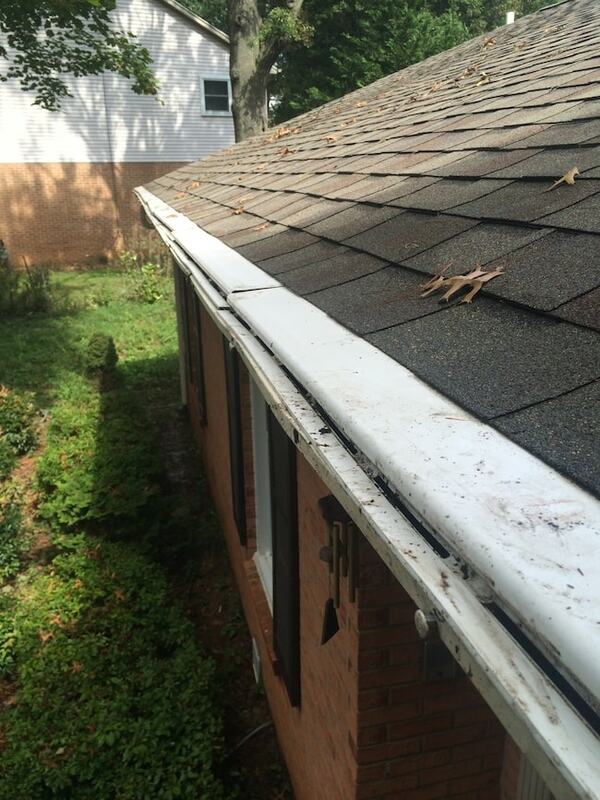 Plus, I’m too cheap to pay someone to do my gutters right now. The 30-Day August Upgrade Room Challenge literally broke the bank (can we say “nonsufficient funds”??). So now that this section of gutters were cleared, I was ready to make the door pretty. TIP#3 Don’t Go Into It Blindly! Even though it’s “just paint” and you can paint over it if it doesn’t look right, you owe it to yourself to at least “try it out” before you get started so that you’re less likely to waste your time if you’re unhappy. Is This Going To Look Right?! I had tried their app (free in both iPhone and Android) that lets you sample their 24 colors on your door just by taking a pic. I just had to snap and then drag the lines to crop it…. The red was a little….bright. But then, I figured it was just the screen resolution. It was fun testing out all the colors, though! I’m not trying to be funny! Even my yougest made a comment about it! But the blood red wasn’t going to stop me. I knew it wasn’t going to look that bright once it started to dry…. In the DIY world, it seems like two coats is the standard coverage for ANYTHING. You can see why. Here with just one coat, the coverage is spotty. Looks like my youngest son painted it. Trust me, two coats will look perfect! After 2 wet coats, it was looking pretty good! 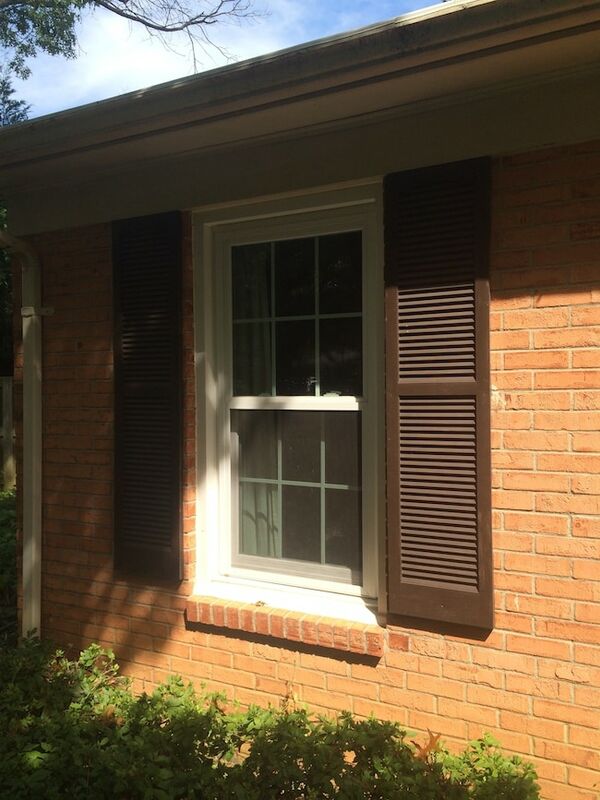 Tip #5 Don’t Forget Your Shutters! 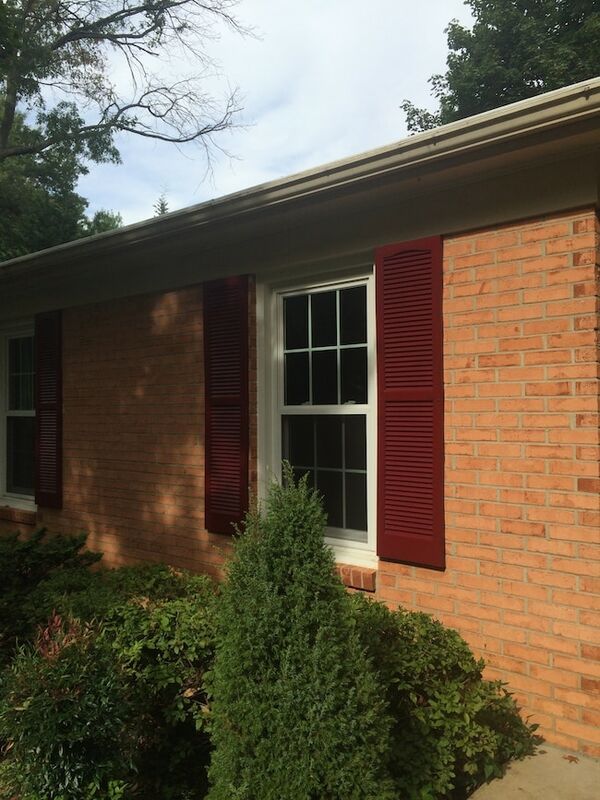 The question here is, “Should You Match Your Shutters To Your Door?” when you paint your front door or makeover your shutters? You don’t have to. 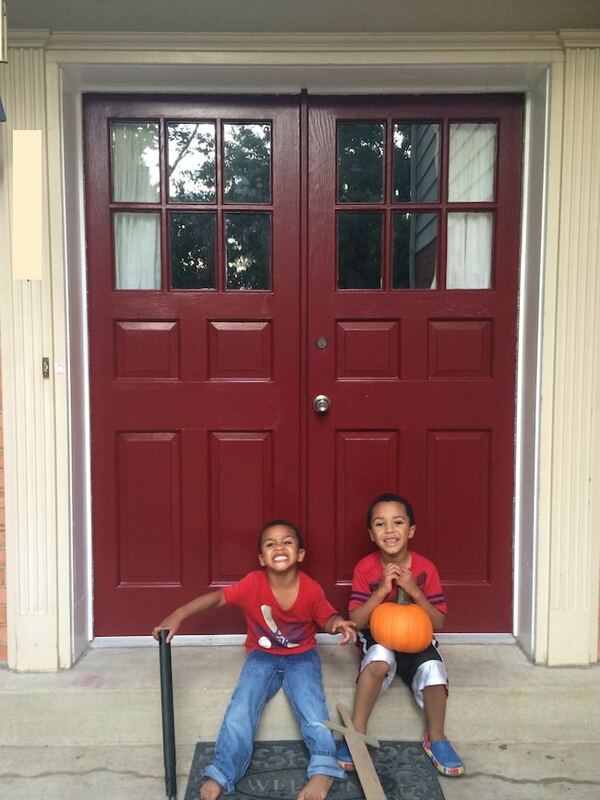 I’ve seen many of red doors with black shutters (which looks GREAT on a white or gray house!) 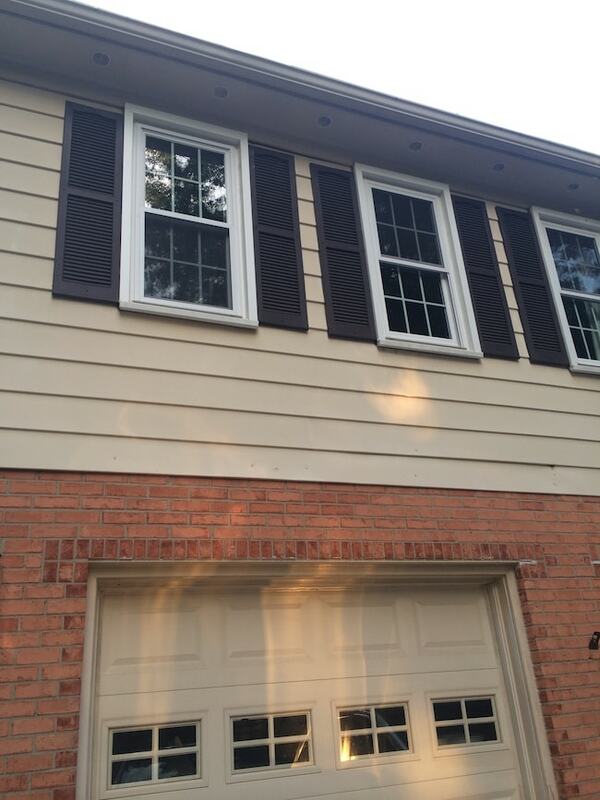 But in my case, because my house was already a couple shades of orange brick and off-white vinyl, I figured I would keep the shutters the same as the door. They badly needed paint. But I was just hoping that all that red wasn’t “too” much. It’s okay to do a sample to see if you like it. If not, pick another color that compliments your new door and house color. There are not rules here :). Worn….desperately in need of paint! Why had I never looked this closely at my shutters? I had no idea they were so scratched up…. Okay, I think this may work….I’m digging this deep red! I had to go back and edit this post because of a reader/friend that told me about her dad that fell off a ladder 20 feet high with terrible outcomes. Yikes….that scared me straight! Be careful when using a ladder to paint your shudders (or doing anything with ladder work). I didn’t have a spotter, but probably should have. I still haven’t done the upper shudders. 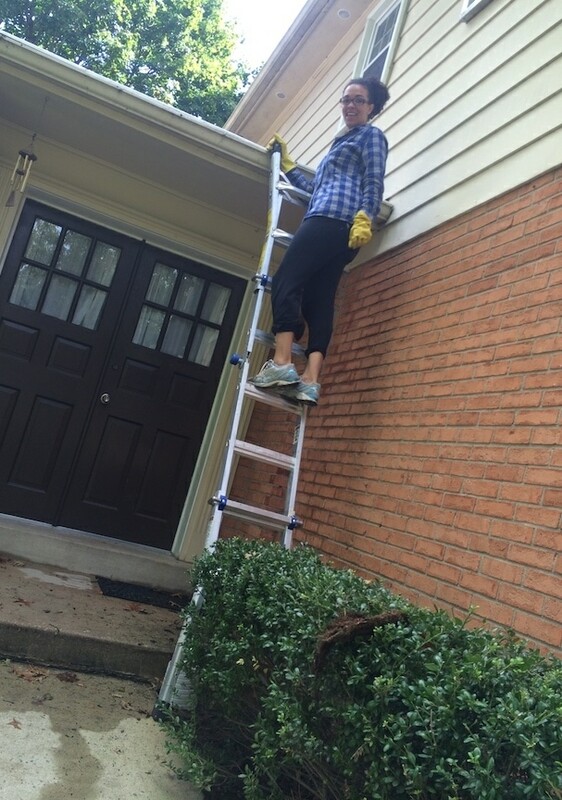 I guess I’ll get to them some day….when I have a ladder….. 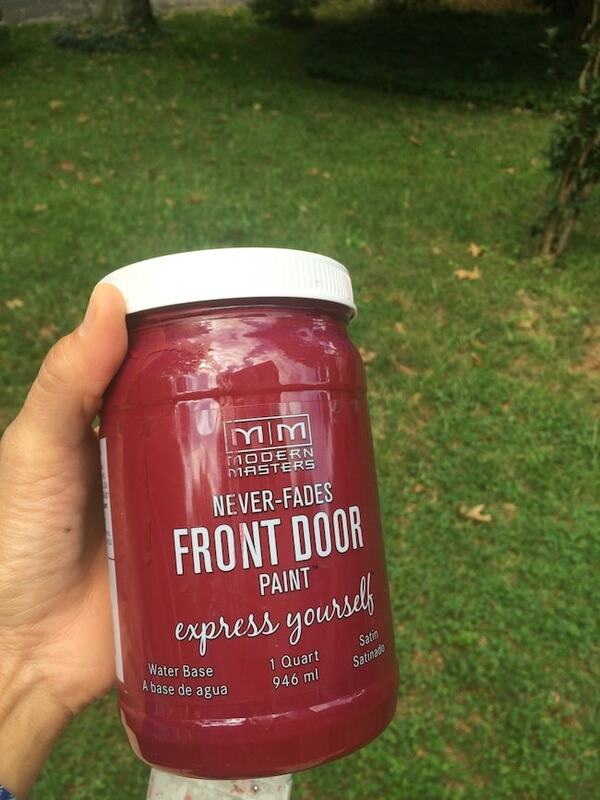 If you’ve ever wanted to add a punch of color to your exterior, painting your door (and maybe your shutters!) will be the easiest way (aside from adding pretty flowers!) :). This makeover didn’t cost me anything because Modern Masters supplied the paint. But for a normal quart of this stuff, you’ll pay $34.95 on Amazon . It went a long way! I used two coats on (basically) two doors and 4 shutters, and I still had some left in one quart, which was impressive! Okay, so what do you think??? Big improvement over the yuck brown??!! 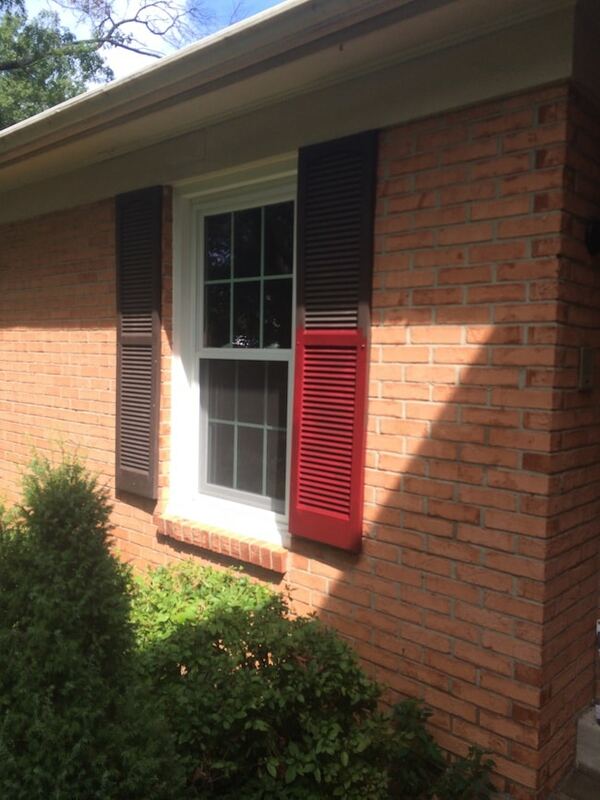 And what do you think– do you have to match your shutters to your house, or can you mix them up? Leave a comment below to tell me! « BEFORE & AFTER: Jen’s Teacher’s Lounge Retreat! Love it! I need to do our door so will follow your advice! One question, did you paint the red both inside and out or just outside? I just love reading your posts and looking at all the great projects. Keep up the good work. Thank you so much for that, Stephanie! 🙂 That means a lot! I LOVE that red. 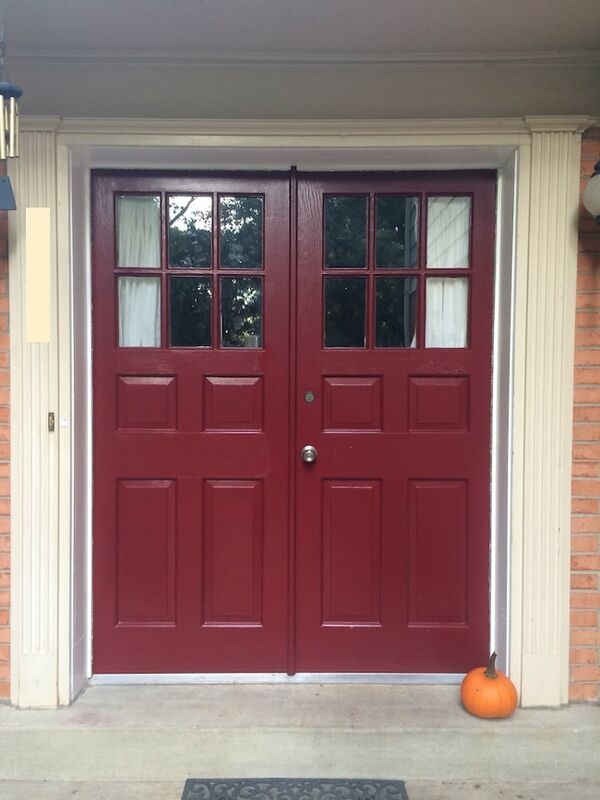 Our house has all faded red doors and I want to repaint all of them a brighter red. I have a couple questions. Did you have to wash them down with anything special to clean them before painting? Ours are all steel doors and I dread having to remove the old paint. Secoundly, do they suggest a primer first? Third, how long did it take to dry? 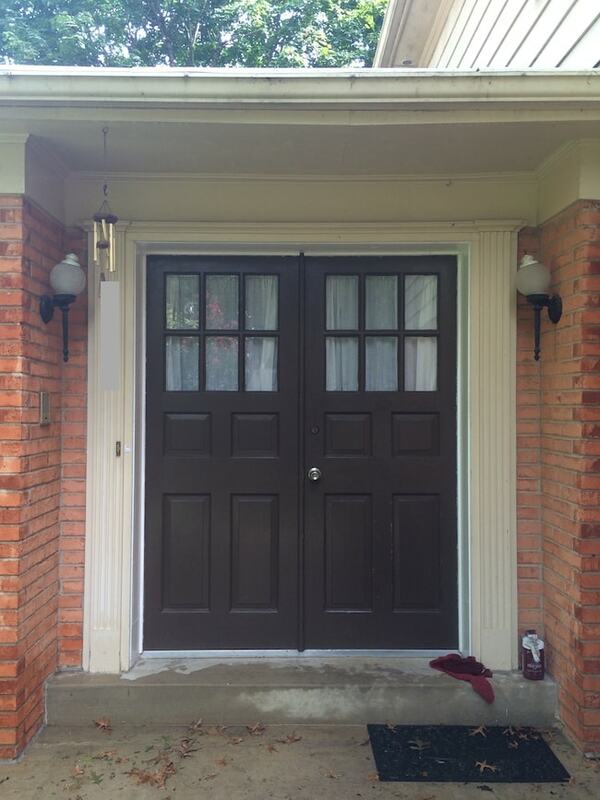 Only 2 of the 4 doors have storm doors so leaving them open extended periods of time is tricky. 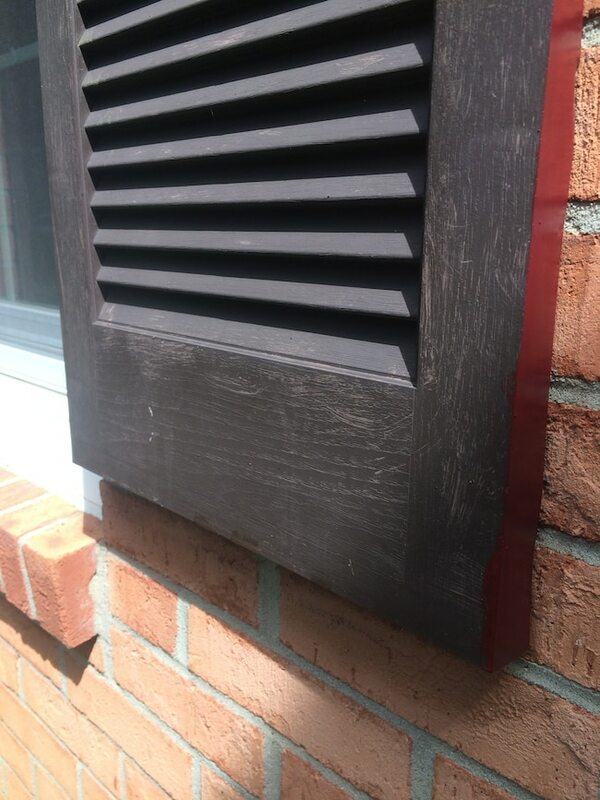 By the way, all our shutters are black and look great with the red doors. Thanks, Linda! Yes, you will definitely need a primer. I did it WRONG in my post :(. I was thinking it was similar to Annie Sloan in that you don’t have to use a primer. But you do. I have noticed a spot that is already peeling. Stupid me for not reading the back. I hate the idea of priming since Chalk Paint was discovered. HA! 🙂 It doesn’t take long to dry. As for washing them, I just wiped with a wet rag. However, if you want to be really thorough, you can use TSP, which is a good cleaner. Good luck!!! I love the red! You are brave to take on such projects all on your own. I have jumped head first into the DIY unknown and plan to paint my dining room furniture with Annie Sloan Chalk Paint. If you care to see my results I will post pics when it’s completed.